Dedicated to restoring the fine craft of real chocolate wherever discerning mouths are found. Legacy Chocolates is committed to the production of fresh, handmade, nutritious, high quality chocolate at affordable prices. 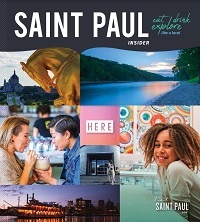 Shop the day away in Saint Paul's historic downtown. Downtown, everything’s waiting for you (and yes, we included a skyway section).